In the picture, the author tried to depict a great historical event – the Battle of Trafalgar. This bloody battle took place between Great Britain and the French-Spanish army. The naval battle entered history as one of the most significant battles of the Napoleonic war. It received its name from the Cape Trafalgar, located on the coast of Spain, near the city of Cadiz. 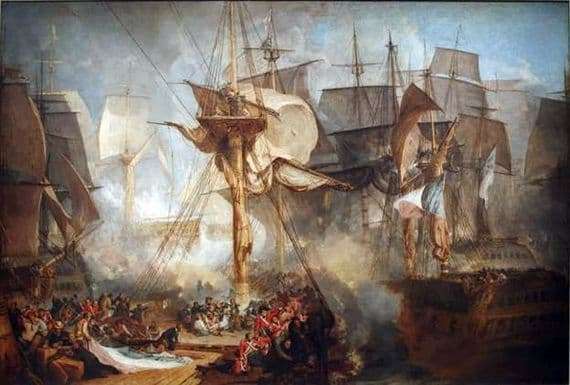 In this decisive battle for the opponents, the troops of France and Spain lost about twenty of their warships, while the English army did not lose more than one. However, during this bloody battle the English fleet was left without its Vice-Admiral Horatio Nelson. For Britain, the victory in this sea battle played a huge role. After her victory, she became the “mistress of the seas”, proving her superiority in shipbuilding, and Napoleon Bonaparte stopped trying to capture the British territories and began military battles with Russia and Austria. Since Turner was a hereditary Englishman, such an important event for his country could not leave him indifferent. He decides to write a picture of the plot of this battle, and a picture of enormous size, of such dimensions, which he has not yet written. The picture turned out truly majestic. It overthrew the Franco-Spanish army and the British winners. The power of the beautiful English ships is amazing. They are huge and occupy almost the entire composition of the picture. After all, it was not for nothing that England won the battle and they began to call her “the mistress of the sea”. The white sails of numerous English ships filled the entire sea space. They slowly swing on the waves of the sea, celebrating their victory and demonstrating superiority over the defeated French army.